I’ve been preoccupied this summer with a sick cat. 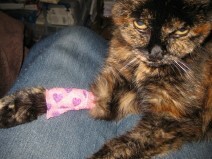 As I said in June, our 18 year old tortie Wysi ‘crashed’ due to CRF and needed a lot of care (including 2 hourly feeds for a few weeks). Just as we got her CRF stabilised, she was diagnosed as hyperthyroid. She’s been on medication for that for a month now, and she is having a lot of gut problems which may be due to that medication or may be due to her CRF. She’s had 3 stays at the vet’s on IV, from which she comes home with a pretty bandage on one leg (doesn’t she look impressed with that? ), and too many other visits for me to count. I hope we’ll get her re-stabilised soon, for her sake and ours. So, I’ve not had much craft stuff to blog about recently. I have done a little more of the Icarus, though I need to tink a couple of rows as I lost concentration while knitting at our monthly spinning evening – no pictures of that, though. We went to a 2-day printmaking workshop with Karen Carter last month. Because we were shown how to use the etching press safely, that ‘qualified’ us to go to the monthly printmaking afternoons at the college, which we did last Saturday. The workshop covered collagraphs, drypoint ‘etching’ and linocuts. DH did some amazing drypoint prints, but I just did a lot of test prints and samples. I decided to use the same drawings I’d used for the monoprints in April so I could compare the difference in line quality more easily (and because I was too brain-dead that week to come up with new images). These are not supposed to be aesthetically interesting – just trying out techniques. I also used the backgrounds to try some different effects. Drypoint is a technique which produces prints which look like etchings, but instead of using acid, you ‘draw’ your image onto a synthetic plate with a needle tool, or add texture with an abrasive. I started with a ‘frosted’ translucent polypropylene sheet – the kind sometimes used to make filing folders. One side is more textured than the other – the first sample is the smoother side. Next I tried using a sheet of Rhenalon, which is smooth and transparent. I found it more difficult to use than the polypropylene, as if I used enough pressure to get a clear line the tool slipped too easily. DH preferred it, though, as he likes the clear background. I also did some collagraph samples at the workshop, and although I didn’t have time to do any linocuts there, I did get one done at the open studio. I’ll try to get scans or photos of those soon and post them here. Monoprints are a type of print in which you usually only create a few copies (sometimes only one), and they are all different. 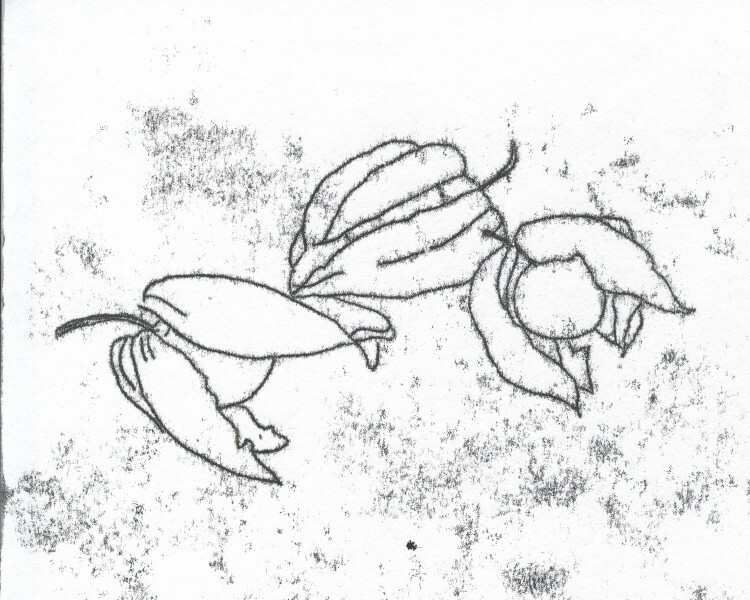 The method we used is known as direct trace drawing, and is supposed to have been invented by Paul Gauguin. 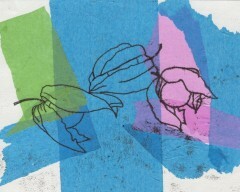 First, create an original drawing, and tape it to the back of a sheet of printing paper. 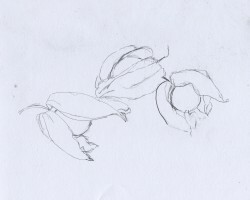 Here is my drawing – yes, physalis fruits again! Next, ink a perspex sheet with water-based inks which are waterproof when dry, which makes it possible to do more work on the print later if wanted. 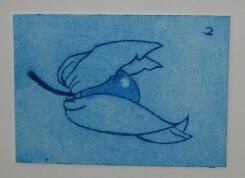 [It is possible to use oil-based printing inks too, or watercolours, gouache or other mediums.] Lay the printing paper gently over the sheet with the original drawing on top. 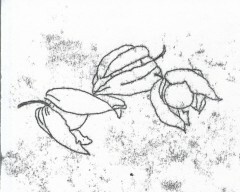 Trace over the original drawing using a pencil, pen or other instrument. The printing paper will pick up ink along the drawn lines, but in a soft, smudgy way. Anywhere you touch the paper will also produce a smudge, so you need to avoid touching the paper as much as possible, but you can also create shading with deliberate touching. Judging the correct amount of ink to use on the sheet requires experience (and trial and error), but you can re-roll the sheet without adding more, so each successive print will have less ink. You can also remove excess ink before trying again by laying absorbent paper like newsprint over the sheet and smoothing gently. 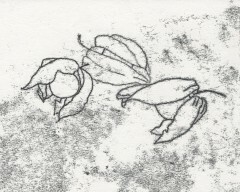 The print on the left above was done first, then the one on the right was done without adding fresh ink, just re-rolling. You don’t have to print onto plain paper. 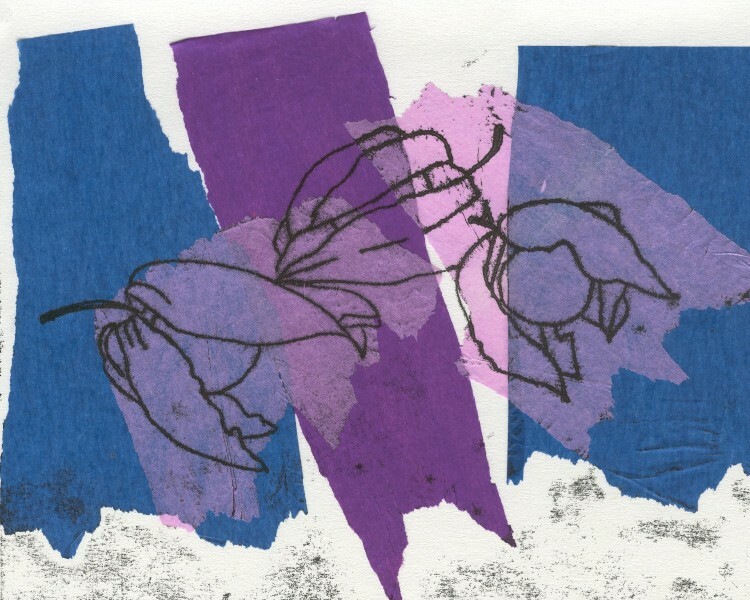 We collaged tissue paper onto the printing paper before making some of the prints. 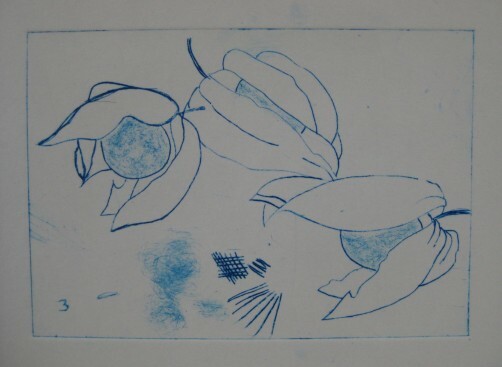 You can also do further work on the image after printing, but we didn’t have time to do that at the class. There also wasn’t time for me to experiment with deliberate pressure to produce shaded areas. 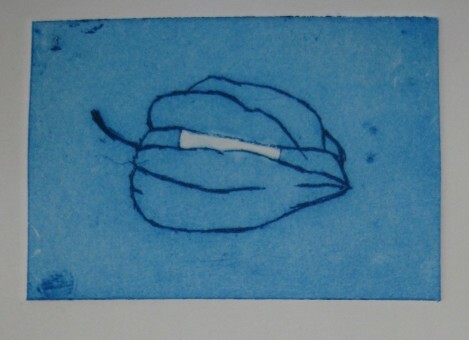 We have signed up for a printmaking class with Karen Carter (the tutor for this class) at the same venue in August, and I am greatly looking forward to it. I am hoping to experiment with more monoprinting at home before then, and perhaps try some collagraphs too.